Feature documentary Tyke: Elephant Outlaw, which screened recently at the Sydney Film Festival, will be broadcast in the BBC’s Storyville slot, ahead of its inclusion at the Melbourne International Film Festival. 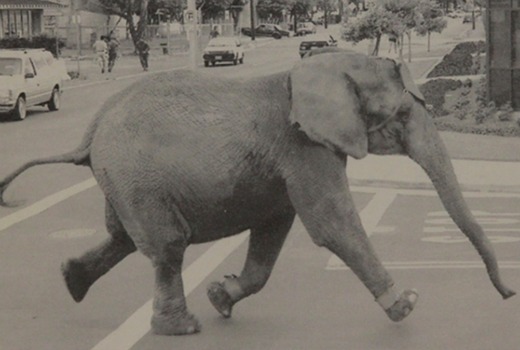 In 1994 a circus elephant went on a 30 minute rampage in Honolulu in a bid for freedom before being shot, but for many came to symbolise animal rights issues and subsequent legislation. “We’ve had an amazing response to the film around the world. Everywhere we go, the issue of interaction between humans and wild animals and the continuing practice of keeping animals for human entertainment remains extremely current and hotly debated,” says co-director Susan Lambert. The film, described by IndieWire as “tragic and unforgettable”, tells the gripping and emotionally charged story of Tyke, a circus elephant who went on a rampage in Honolulu in 1994, killed her trainer in front of thousands of spectators and died in a hail of gunfire. Her break for freedom – filmed from start to tragic end – traumatised a city and ignited a global battle over the use of animals in the entertainment industry. Like the classic animal rebellion film King Kong, Tyke is the central protagonist in a tragic but redemptive drama that combines trauma, outrage, insight and compassion. The film includes the astonishing archival footage of her breakout from the circus and the rampage through the streets of Honolulu. The film also features interviews with people who knew Tyke and were affected by her death – former trainers and handlers, circus industry insiders, witnesses to her rampage, and animal rights activists for whom Tyke became a global rallying cry….often with strikingly differing perspectives on Tyke’s life and death. July 22 at 9pm on BBC World News. Was really hoping to see this on BBC World News but I don’t think it is screening there (there is no Storyville on at that time or ever on World News from what I looked up), or screening anywhere on TV in Australia for the foreseeable future. Has this time/date been mixed up with BBC Four in the UK airing it on Storyville at 9pm July 22 (UK time)?